Since my early childhood was taught to live up to a standard of worthiness. I am a Coertze and I was continuously challenged to live a life worthy of the Coertze name. Then I was born a Baptist before I became a born again Christian, but we were often told that we need to live a life worthy of being a Baptist. So ‘Baptist boys don’t drink, smoke or chew or go with girls who do.” At school we were threatened with expulsion if we were caught doing anything wrong in public with our school uniform on as that will tarnish the worthiness of the name Nelspruit Hoërskool. And so, I guess all of us have grown up defending the worthiness of some name. Now, I guess there is nothing wrong in protecting the worth of a family name, or a church or a school, but something I was not reminded much of – is the worth of my calling as a Christian. Sure, we were bombarded with legalism to protect the value of the club called ‘church’. For this reason there are Christians today who dress alike, behave alike, follow the same rules and uphold a basic socio/Christian cultural ethic, but all of this to protect the glory of the local body. Any sin committed by anyone is obviously and correctly frowned upon, but more than often it is not about the worth of my calling nut the worth of the local congregation. This is the very reason Christians cannot forgive when a fellow Christian has sinned. We all know that God forgives and Christians don’t, but the question is why? The answer is simple. The church has become all about ‘US’ and ‘our worth’. Unity often centres on doing things in a way that does not break the MAN MADE unity, instead of Unity around a GREATER PURPOSE and for a GREATER WORTH. I have learnt this years ago. Unity is not uniformity. Wearing the same uniform does not make us one. Unity is not two cats tied together by their tails. Unity is not simply being allowed into the choir, even when everybody knows you sing false. True unity starts in the heart, and is based on a worthiness beyond our petty issues in life. It is not about micromanaging one another to look like me, to love what I love and to hate what I hate and to behave in a manner that I would, but it is about maintaining the Unity of the Spirit through the bond of peace which causes us to love what God loves and to hate what God hates. Let’s read together. Ephesians 4:1-6 (ESV) “1 I therefore, a prisoner for the Lord, urge you to walk in a manner worthy of the calling to which you have been called, 2 with all humility and gentleness, with patience, bearing with one another in love, 3 eager to maintain the unity of the Spirit in the bond of peace. 4 There is one body and one Spirit—just as you were called to the one hope that belongs to your call— 5 one Lord, one faith, one baptism, 6 one God and Father of all, who is over all and through all and in all. So, let’s look together this morning at that which is truly worthy of upholding which is not based on legalism but heart. In Ephesians 4:1 Paul urges us Christians "to walk in a manner worthy of the calling to which you have been called," This does not mean that we should try to deserve our place in God's favour. It means that we should recognize how much our place in God's favour deserves from us. The focus is not on our worth but on the worth of our calling. If we go back to chapters 1 through 3, we can catch a glimpse of the calling Paul means. 1:4, God chose us for himself before the world was created. 1:5, he predestined us to be his children—and that means heirs of all our Father owns! 1:7, he sent Christ to atone for all our trespasses. 1:13, he sealed us with his Holy Spirit to preserve us forever. 2:7, he promises to spend an eternity increasing our joy in the immeasurable riches of his grace. 3:10, he has given us the mission as a church to display his wisdom, even to the principalities and powers in the heavenly places. Or as 1:12 says, we are "destined and appointed to live for the praise of his glory." In other words, the privilege and purpose of our Christian calling is greater than the privilege and purpose of the Coertze family, the Baptist Church and Nelspruit Hoërskool. Nothing can compare with our calling that attains divine son-ship and we become beneficiaries of all that God owns. All of this earthly stuff will last a certain number of years, but our calling will last forever. If any of these temporal stuff qualifies for a life of worthiness to uphold its worth, how much more should the honour and privilege of being made a Christian shape our lives! In Ephesians 4:3 the way to lead a life worthy of our calling is to "maintain the unity of the Spirit in the bond of peace." Verse 2 tells us how to maintain spiritual unity: "2 with all humility and gentleness, with patience, bearing with one another in love," The reason, we cannot enjoy the fullness of the worth of the temporary is because we have not discovered how to enjoy the fullness of our calling. We play Christian-Christian. Why do Christians fight one another? Why is the church the only army where we kill our wounded? It is because we offend one another on the temporal level. Why do we offend one another on the temporal level, and why do they so easily take offence? It is because we have not discovered the joy of our calling, which forces you to maintain the unity of the Spirit. But before we look at how to maintain the unity of the Spirit in verse 2, we need to make sure we know what it is. What is the kind of unity that will bring honour and glory to our high calling? 3. What Is the Unity of the Spirit? This text shows that, in a decisive act of atonement and reconciliation, Christ has already made us one. It does not matter if you speak Afrikaans or English or Pedi or blond, if you are in Christ you are by nature one. The blood of Jesus has bought you, and while we say on family level that ‘blood is thicker than water’ I want to tell you on the basis of God’s Word that ‘the blood of Jesus Christ is much thicker than water.” What Christ has accomplished at Calvary we should maintain by the Spirit. But in another sense the unity Christ purchased and guaranteed with his blood must now be lived out and brought to full expression in the life of the church. In this sense it is a goal to be attained. So if the same basic unity is spoken of in 2:13–16 and 4:3 and 4:13, then we can now define it. Christian unity involves three things that we should have in common. Ephesians 4:13 speaks of a "unity of . . . the knowledge of the Son of God." That is our common convictions about Christ. That verse also speaks of a "unity of faith." That is our common confidence in Christ. And Ephesians 2:14 speaks of the “end of hostility”. When hostility is replaced with love, we have a common care for each other. So I would sum up Christian unity from Ephesians 2–4 as having common convictions about Christ, common confidence in Christ, and common care for each other. Ephesians 4:3 calls this the ‘unity of the Spirit’. It's the Holy Spirit who frees our hearts from irrational, self-defensive prejudices so that we are willing to own up to true convictions about Christ (1 Corinthians 2:14–16). It's the Holy Spirit who enables us to have faith in Christ and to cry out to God with confidence, "Abba, Father" (Romans 8:15–16). And it is the Holy Spirit who bears the fruit of love in our lives and gives us a common care for each other (Galatians 5:22). So our common convictions and confidence and care are all from the Holy Spirit. Therefore Paul calls it the "unity of the Spirit" (v. 3). Now when we go back to verse 2 to see how we maintain this unity, we see two stages of love. Neither of these stages is natural to human nature. Both are the result of the work of the Spirit in our lives. Let's look at each one briefly. The knowledge of our high calling should make us feel very humble. Christian ‘humility’ is a disposition to think lowly of ourselves and highly of Christ. Christian ‘gentleness’ is the demeanour of a person with this disposition. Precisely because he has been granted to know God by grace, the Christian is a person of humility. He regards his knowledge as small and lowly because he has seen the omniscient God. He regards his strength as small and lowly because he has seen the omnipotent God. He regards his righteousness as small and lowly because he has seen the glory of God in the face of Christ His Redeemer. And since the Christian is oriented on God and not man, he is not puffed up by any little superiority he may have over other Christians and he treats all graciously. Christian humility makes a person feel awkward receiving praise. It makes a person recoil from the contemporary counsel of self-assertiveness and self-esteem and self-confidence. The great delight of the lowly Christian is to enjoy the free, unmerited mercy of God. All his longings are satisfied in God. God is the one he esteems. God is his confidence. God is the one who will assert himself someday to vindicate the poor in spirit and to make the last first. In the meantime, the man of humility is the servant of all. This is the first stage of love, and it is the work of the Holy Spirit opening our eyes to see the majesty of God's holiness and the minuteness of ourselves. Humility is a prerequisite of patience. Haughty people are not patient. The more highly you think of yourself the more quickly you will think you should be served. "Who do they think they are to keep me waiting like this!" “I just hate it when the church does not do things my way”. “I don’t care who you are but don’t inconvenience me.” But if you have a disposition of humility, it won't feel so inappropriate when you are not treated like a dignitary and when the fruits of your labours are slow in coming. If you have seen the majesty of God's holiness, you know your own minuteness and sinfulness, and you don't presume to deserve special treatment. And if you have seen the magnificence of God's grace, you know he will give you the strength to wait and will turn all your delays into strategic manoeuvres of victory. Humility is a prerequisite of forbearance. ""2 with all humility and gentleness, with patience, bearing with one another in love,..” Another word for "forbearing" is "enduring." Just like meekness is the demeanour of lowliness, endurance is the demeanour of patience. I am so glad Paul said we must endure one another. This frees me from the hypocritical need to think I or anyone else in the church, am perfect. Perfect people don't need to be endured or forgiven (Colossians 3:13). But we do, often. Paul is not naïve. He knows that there are a few people at Logos or at Houtkruis who are grumpy or critical or unreliable or finicky. Paul knows that Nicki Coertze and Theuns Voges have gaping holes in the fabric of their sanctification. So Paul’s counsel here is not how perfect people can live together in unity, but how real, imperfect members of Logos and real imperfect members of Houtkruis can maintain the unity of the Spirit, namely, by enduring our fellow members in love. The focus in verses 2 and 3 is not so much on how to maintain our common convictions or our common confidence. Those are assumed as a basis, and the focus is on how a group of imperfect people can preserve a common care for each other. How can you keep on caring about a person who doesn't like you? Or a person who likes music you don't like? Or a person who opposes you and wants to frustrate your dreams? How do you maintain the unity of the Spirit with them instead of becoming hostile and cold? Paul's answer: be humble in spirit so that you can patiently endure their differences and their sins. A man of humility is keenly aware of the immensity of his debt toward God and how he has dishonoured God through unbelief and disobedience. He is also keenly aware of God's amazing grace that saved a wretch like him. Therefore, the man of humility cannot easily or quickly retaliate when he is wronged. He knows that before God he doesn't deserve anything better, and he knows that if he returns evil for evil, he would be saying to God, "You were a fool for being patient with me and enduring my sin and returning good for my evil." And that would bring far more disgrace and discredit upon our high calling than any way in which we do not live up to the worthiness of our family name, or the school we attended or the church we belong to. 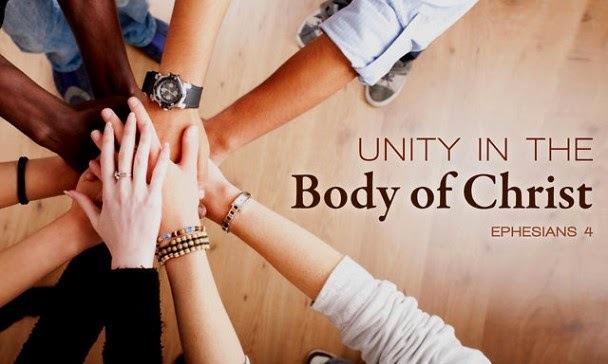 It is not about Logos or Houtkruis, it is about the “5 one Lord, one faith, one baptism, 6 one God and Father of all, who is over all and through all and in all.” It is about the unity of the Spirit so that we together can arrive at maturity. Therefore, let's not be puffed up but humble and meek. And let's not be impatient or resentful, but long-suffering and forgiving. Then the unity that Christ died for to create will become real in our church, and we will not bring any disrepute upon the great God who called us into his kingdom and glory. Let’s leave here today and make sure that we live our lives worthy of the calling we have received – to the Glory of God alone.